The exponential growth of binary options trading and introduction of payment system based on the Bitcoin cryptocurrency has together opened a plethora of exciting opportunities for tech savvy investors and speculators. For a beginner who is new to the world of binary options, it may seem that Bitcoin is simply yet another payment system. However, a close look at the digital currency would reveal the added benefits of using it in binary options trading. No intermediate in payments: A binary options trader can make deposits to his trading account almost instantaneously without depending on any third party payment processor, including banks. Such a facility is crucial considering the fact that opportunities can emerge at any point of time in the financial markets. With the use of Bitcoin, there will not be any need for a trader to park too much of money with a binary broker and can deposit as and when required. Low transaction charges: The processing charges for Bitcoin transactions are nil as long as the coins are not drawn from multiple addresses (large data size). Thus, a trader who has the habit of making deposits and withdrawals often can save a considerable amount of money, which would otherwise get deducted as charges for using e-currencies, debit/credit cards or initiating a bank transfer. Transaction fees are voluntary and paid only when there is a dire necessity to speed up the transaction, which usually completes (two confirmations) in five minutes or less. It is not uncommon to see a binary option trader executing more than 10 trades a day. Such traders will be regularly making deposits and withdrawals. Bitcoin’s low transaction charges indirectly encourage more traders to participate in binary options trading. Quick and verifiable deposits/withdrawals: Since Bitcoins are not physically located in any country, transfers are done quickly on a 24×7 basis with no limits, delays or exorbitant fees. Because Bitcoin payment system uses a public ledger, all transactions are verifiable. This instills confidence between a binary option broker and trader who may be thousands of miles apart. Protection against fraud: All binary option brokers and traders are well aware of credit card and paypal related frauds including chargeback. Bitcoin transactions are irreversible and secure. Thus, it increases the level of comfort while dealing with an unseen client or entity. In fact, binary option brokers encourage traders to make Bitcoin deposits to avoid unwarranted financial issues. Privacy: If used properly, Bitcoin offers reasonable level of privacy to the transacting party. Since unlimited number of anonymous Bitcoin identities can be created, a binary options broker can use multiple addresses to receive and send Bitcoins to their clients. Likewise, a high net-worth trader can keep the bulk of the coins in a separate address without exposing it in public space. This facility ensures safety and privacy for both binary options broker and a trader. Avoids legal restrictions: The peer-to-peer Bitcoin payment system allows anonymous transactions. Thus, a trader living in countries with severe exchange controls can also participate in binary options trading. Furthermore, profits can be held in Bitcoin accounts without bringing back into a country torn by internal conflicts. As long as the country is not in black list, binary option brokers will have no qualms in accepting a wannabe trader from anywhere. The trader can start earning without any worries over exchange controls and currency devaluation issues. Reduces tax burden: Invariably all binary option brokers suggest their clients to be a responsible citizen and take care of tax issues. However, there are countries where government exists only virtually or for name sake. A trader residing in such a country can use Bitcoin as a medium of transaction to avoid high level of taxation. 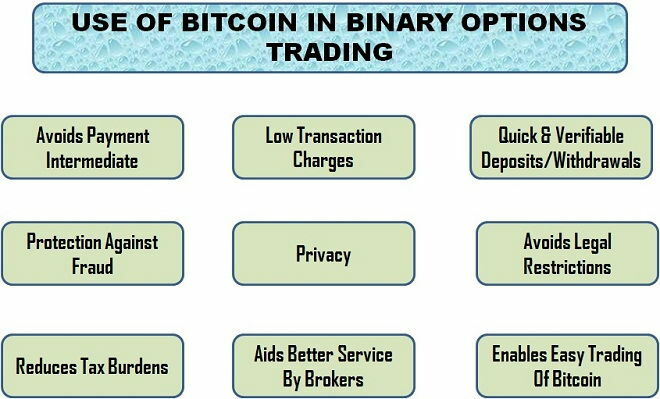 Aids better service by brokers: Binary options brokers certainly prefer Bitcoin payments over other traditional form of payments for the simple reason that it enables them to concentrate on providing better service to clients rather than trying to resolve cross-border payment issues. Enables easy trading of Bitcoin: Not only Bitcoin serves as a medium of payment but also can be traded against major fiat currencies and in particular US dollar. Thus, a trader can straight away deposit Bitcoin and speculate its movement against the US dollar instead of making a deposit in some other currency and then converting (and lose money for exchanging) it to Bitcoin every time an opportunity arises. Since major binary options brokers offer trading of Bitcoin against the US dollar, options trading can be done comfortably and the profits, if any, can be withdrawn as Bitcoin itself. Since Bitcoin is slowly but steadily gaining acceptance as an alternative safe haven there is very little to worry about the frequent rampant fluctuations. With global economic stability still a dream, more than earning money, wealth management has become a priority. The use of Bitcoin will enable a binary option trader to largely achieve such an objective.